Others have theory. We have reality. Custom Designed High Performance RF Filters for all industries. Private, Commercial, Government, Military. Our High Pass RF Filter 2 thru 18 Ghz is in stock. Modification available. Our Standard SMT Packages offer shorter lead times and are cost effective. Bree Engineering custom product lines include a broad range of both performance characteristics and unique applications. See examples of our designs. Since 1999, Bree Engineering has been satisfying customers by supplying custom RF Microwave filters, multiplexers and related components with excellent performance in small sizes and innovative configurations. We design to your specifications. All parts are built to order, and special requests are welcomed! We also have special lines of surface mount package designs for lumped element filters which offer excellent performance, delivery, and competitive pricing. We are proud to service Commercial, Industrial and Defense markets. All products are developed, built and tested at our facility in San Marcos, California. Bree Engineering supports small prototype requirements, and, as well, we have supported sustained large production runs exceeding 10,000 filters shipped per week. Let us assist with your next filter requirement. We have very fast response time for all quote requests, and we can help in the early stages of your custom rf microwave filters design with accurate, reliable design simulations showing what will really be achievable in production. 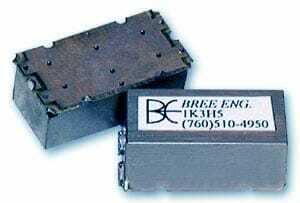 Bree Engineering also offers a complete line of cavity and lumped element filters in configurations with connectors and pins. Please contact our technical sales representative for additional electrical and mechanical requirements. We have been featured in many industry publications including Wireless Design Magazine and others.